John M. Fitzgerald is a poet, writer, editor and attorney for the disabled in Los Angeles. A dual citizen of the United States and Ireland, he attended the University of West Los Angeles School of Law, where he was editor of the Law Review. The Mind was published by Salmon Poetry in 2011. His first book, Spring Water, was a Turning Point Books prize selection in 2005. Telling Time by the Shadows was released in April 2008 by Turning Point Books. As yet unpublished works include Primate, a novel and screenplay, the non-fiction The People of the Net. He has contributed to the anthologies Poetry: Reading it, Writing it, Publishing it (Salmon Poetry), Dogs Singing: A Tribute Anthology (Salmon Poetry, and From the Four-Chambered Heart: In Tribute to Anais Nin (Sybaritic Press) as well as to many literary magazines, notably The Warwick Review, Barnwood Mag, Askew Poetry Journal, Spillway, and Lit Bridge. There’s definitely a lilt to the Irish/American poet and more a European diction than an American accent. This is seen is by word choice and tone, velocity of syllables within the line and his selection of subjects. We don’t know what this poet eats for breakfast or the neighborhood he lives in. He’s not interested in actual everydayness He places great importance on an aerial view of life with an almost biblical seriousness. His poetic issues include relationships, poets and poetry, the muse, chess (a handsome set of poems), ghosts, God and fairy tales. Fitzgerald is what he claims he is — a storyteller looking at human behavior from a high place. His careful stanzas, precise rhythm are products of a man schooled in the kind of literature that changed Irish and American cultures to a high form. In a way he’s an activist determined to preserve what’s best in speech to keep it alive. Ceaselessly flick me with light. free to believe as I’m told or be beaten. and I’m so hung over yet have to wake. but I am the meat to be eaten this day. where serpents sing children lullabies. Hush, the snake is on the prowl. when my strings get jerked with that fear of falling. at the end of a dream about flying away. “… in this new book by John Fitzgerald…we encounter playful lines such as (in speaking of tooth fairies) “They fashion piano keys from our teeth / to produce that twinkling sound in flight” and (more menacingly) “Hell is awake when the liquor store’s closed / and the spirits are all drunk.” We even get a kind of compressed philosophy of the relationship of language to the experience it tries to name in the line “He stresses each embalming syllable. 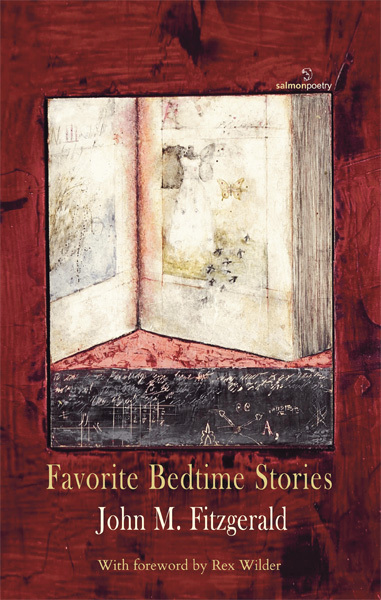 Favorite Bedtime Stories by John Fitzgerald (Salmon Poetry, 2014) is a book of poetry that grabs the reader with the sinuosity of a leopard. It has a subtle way of penetrating in the pores and, much like the poet himself states, “I am poet and cannot explain” what makes this “voice like dirt” so intoxicating. “Where I am men hide,” seems to me the perfect key to understanding the subtleness at play. And no, it’s not up a tree with the leopard, but in the leaf that we are turning, in the traces Fitzgerald so skillfully disseminates along the pages. There are infinite stories and as many poems in each of these poems, where the dark ultimately “reveals itself” from “being light.” They remind me of C.M. Escher’s mesmerizing painting Metamorphosis III, where the chess boards leads us to explore always new and fascinating worlds to end up back where we have begun. There are those of us who support the muse because it is a silenced, treasured part of ourselves, locked away. And there are those who release it without the means of support, because we cannot help ourselves. John M. Fitzgerald, poet and lawyer, fits into both categories. In his collection, Favorite Bedtime Stories, he is both the prisoner and the policeman (of himself, of his psyche), as well as his defender and inquisitor. Before rendering judgment (or, rather, instead of doing so) let me first say I understand why this happens (or I think I do), for this dual nature emerges when a poet enters the WORLD and struggles but fails to identify himself there completely; this is what happens when a true poet is blessed and cursed with a powerful intellect— one that sees too much and seeks to break down to the atom a universe both inside and outside of itself at once. and articulates what I [the Poet] disclaim. I swat the muses off me when he leaves. Watch them ascend to my decrease” (p.32). But why? Because embracing my muse (that is my creative self), which I so badly need, I become soft, vulnerable, open, feeling, unable to become criminal or punitive, which one must be to endure the city streets or succeed in courts of law, in this abrasive world – even worse, in this narcissistic sphere that is Hollywood, a place not known for its humility or innate sense of justice, but its reverence for the “photo op”. How on earth an attorney for the disabled, a poet with soul and intellect, better yet, an Irishman came to live and write in Los Angeles and write with such lacaonic verse and labyrinthine thought, full of classical reference, quiet irony and soul, is beyond me. I have much to learn. At first glance, the choice seems masochistic, if not for the obvious sustaining force: that he is married to the lovely poet and actress, Hélène Cardona. But now what about that other muse that “drafts documents”? “The Likeness [a poet addicted to life-changing lines] gathered us here to reflect. Confused on the surface, the depths concur. Between boggling, irrelevant arguments, slip in reason. Every so often, one sticks, I’m sure” (p.33). Yes, we are also sure that his reason and sense of justice will ultimately “stick” somewhere, if not together, but what says Counsel about the poetic Soul? “Counsel renounces rhyme’s every intention. He’s after a third to apply toward a Jag. What kind of person would endure this? “No normal poet would put up with it” (34). Indeed. let’s work on further fragmenting today” (35). Let’s pick apart the man who self-compromised (when he went to law school) to put a roof over his head and become a man. Let us see how “invocation works” to keep him alive, inside, for “[e]very local god is summoned” to the courts of soul and unspent desire, while conscience keeps him on the Los Angeles highway and “bloody muses” cut into his line of thought and “Hell is awake” because the “liquor store’s closed” (34). “Do you even know where the Tylenol is?” (39). “You’re like a lobster seller at McDonalds” trying so hard to appeal to the mind and sensibilities of those who have never tasted your food (39). Who sell “Heaven” every day on TV as a microwavable product, but have never partaken of Elysium fields. And so this poet meanders through the recesses of his mind for sanity and voice in a mind-numbing world, that embalms deadened words, and where “[e]veryone trusts me more than I do” because I’m a lawyer (39). And that’s ok for them, but is it ok for me? Hardly. Millions are doomed to be me, and why? the infinite moon was mine” (75). This is a collection for one familiar both with his role in the world as an “Everyman” and his desire to taste of the tree of Paradise, a Paradise that is not given but created in the mind. John M. Fitzgerald is a poet for writers and men who seek to recapture the subjugated self and save it from drowning and despair, in a world full of suffocating cacophony and deaf ears. This is a collection that, at times, touches the spirit of classical allusion, metaphor and allegory, familiar to John Milton and the ancient Greeks, and yet is, at times, appropriately anchored in the mire of everyday speech. It is a series of dialogues between the self and other (self), poet and Everyman, present and past loves, in an existential quest to understand why some had to die and other voices and personas learn to live with each other in one body. This cohabitation is enough to kill anyone who is both sane and very intelligent. But the breath of life is given and sustained by the poet, before drowning in the world of practicality. And in that darkness, he captures that elusive beauty of the inner voice as of the Coalside Nebulae. He sees the light amidst darkness and there, in that stardust, he resides. I will keep this book safely planted next to my treasured collection of Paul Auster, John Donne and Yeats – not because they resemble each other stylistically, but because they shed light on the struggle to be civilized men acutely aware of their connection to pre-history and the spirit world. ~ Erna Cooper, author and tutor.